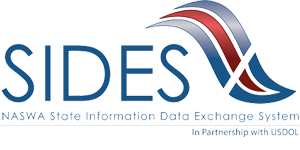 The State Information Data Exchange System (SIDES) is a simple tool to help employers respond to unemployment insurance requests quickly, easily, and accurately. There are two sides to SIDES – SIDES E-Response and SIDES Web Services. SIDES E-Response or SIDES Web Services? There are two sides to SIDES: SIDES E-Response and SIDES Web Services (See Comparison). SIDES E-Response provides an easy and efficient portal for electronically posting responses to information requests and is available FREE OF CHARGE to any Maryland employer with internet access. SIDES E-Response is for employers with a limited number of UI claims. The Internet Key/PIN provided on the paper Request for Separation Information form (DLLR/DUI 207) will serve as the Identification Number/Access Code (PIN) on the SIDES E-Response website. Reply to a paper Request for Separation Information directly via the SIDES E-Response website. If you use a Third-Party Administrator (TPA) to handle the processing of your employees’ UI claims, please consult with the TPA prior to using SIDES E-Response. SIDES Web Services is for employers and TPAs who typically deal with a large volume of UI information requests. SIDES Web Services provides an automated, “computer-to-computer interface” between the employers’ and TPAs' IT systems and that of the state agency. Watch the US DOL video about SIDES & SIDES E-Response. Visit the NASWA SIDES website for additional information. A step-by-step manual SIDES E-Response User Guide is available online to guide you through the SIDES E-Response process.